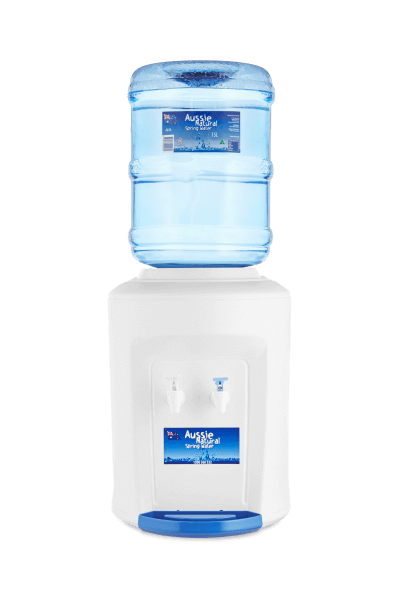 Our Benchtop Water Cooler Cool & Cold Dispenser is an attractive, easy to use unit. This benchtop water cooler offers chilled spring water – for the long hot summer days, and cool spring water for room temperature drinking, cooking and food preparation. To discuss the benchtop water cooler further please don’t hesitate to give our office a call on 1300 360 332. For a compact, easy solution to providing fresh spring water, turn to Aussie Natural. Our benchtop water coolers, perfect for the home or office, can offer you our great tasting water with convenience and reliability. Designed to complement any home or office, our coolers are attractive and easy to use- and our water has been filtered through Western Australia’s natural springs, before making it to our bottling facility in Perth. From our Perth facilities, you can even get our coolers and bottled water delivered straight to your door. No fuss, no heavy lifting, and no wondering whether your water is pure and healthy. You can quench your thirst with ease, knowing that you’ve made the best decision for providing refreshing cool and cold water to your friends and family. No matter where you are or what you’re doing, our cool and cold water coolers can consistently provide you with water at just the right temperature, with a clean, crisp taste that our customers know and love. Our coolers offer cold water for long, hot days, or cool water for drinking or preparing food, with functional taps and an easy replacement of empty bottles.